I DON`T UNDERSTAND WHAT ALL THE FUSS WAS ABOUT? In 1999 Gordon Thomas revealed who murdered the Princess. Gideon`s Spies by Gordon Thomas. This is a brief overview of what Gordon Thomas published. Israeli`s were interested in getting Henri Paul to work for them as many Arab`s stayed in the Ritz hotel where he was head of security. They were monitoring all his activities as a precursor to making him an offer. As a consequence, they were tailing the car he was driving which contained Diana, they saw everything which took place. Gordon Thomas maintains the Princess was murdered by elements of “British” intelligence. It is well known the UK security services sometimes use SAS personnel to carry out tasks for them. 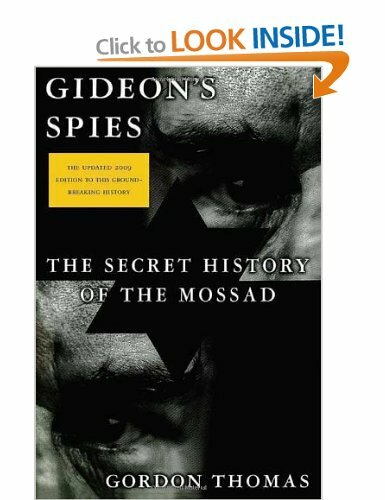 I have just discovered you can download free editions of Gideon`s Spies at this link. You can read all the details for free. I don`t know if the British police have ever asked Gordon Thomas about the information he published and I suspect they are never going to ask him either! The Bible makes it clear there are such things as “Conspiracies” very often it is the VIP`s of this world who are doing the conspiring. “HOLY PLACES” DON`T MAKE ME LAUGH!